“All new ideas are revolutionary. When their underlying theory is proven through practical application, it becomes a matter of time for them to develop and to flourish. Such revolutionary ideas simply cannot be ignored. They cannot be kept in the background. Time and progress are synonymous terms; nothing can stop either. His 34 mat exercises detailed therein are today practiced in Pilates studios worldwide. “……..The full principles of Contrology were revealed to him during World War I. His circus was caught traveling in England when the war broke out in 1914, and Joe and all the others were interned ……….. on the Isle of Man. Here, as weeks lengthened into months and years, he watched his fellow-prisoners sink into apathy and despair, with nothing to do but stare at the bare crumbling walls of their prison, nothing to break the daily monotony but the inadequate meals (for the German submarine blockade was slowly starving England) and an occasional walk around the bare courtyard with nothing to look at but an occasional starveling cat streaking after a mouse or a bird. It was the cats which did it. For though they were nothing but skin and bones - even the most animal-loving prisoners could hardly spare them anything from their own pitiful rations when their own children were begging to be fed - they were lithe and springy and terribly efficient as they aimed for their prey. Why were the cats in such good shape, so bright-eyed, while the humans were growing every day paler, weaker, apathetic creatures ready to give up if they caught a cold or fell down and sprained an ankle? The answer came to Joe when he began carefully observing the cats and analyzing their motions for hours at a time. He saw them, when they had nothing else to do, stretching their legs out, stretching, stretching, keeping their muscles limber, alive. He began working out an orderly series of exercises to stretch the human muscles, all the human muscles. He began demonstrating these exercises to the dejected figures around him, and since they had nothing else to do, they began to do the exercises too. Awkwardly and timorously at first, but under his firm supervision they became more and more confident, more and more bouncy, like cats. They ended the war in better shape than when it started, and when the great influenza epidemic came sweeping over all the countries that had fought in the war, not one of them came down with it. Joseph Hubertus Pilates was born to a very poor family in Munchen-Gladbach in Prussia (Germany), near the Belgian border, in 1883. His father worked long hours as a metal worker repairing the machines at the local textile factories where his mother had also worked before her marriage. But Joseph’s father was also a dedicated gymnast and took Joseph and his brother to his local Gymnastics club (akin to a local “Gym” today but also with general fitness exercises and also including distance running, marching, wrestling etc). Here his father worked out, as well as using his work skills to maintain their machines. The second of eight children, Joseph was not a strong child suffering a rage of ailments - at the gymnastics club he could take part in the various floor and apparatus exercises, and in addition his father also taught him boxing. Boxing had been illegal in Germany, unlike in Britain, and so it was a largely unpractised sport. In her biography of Pilates, Eva Rinke explains how both Gymnastics and Boxing were focussed on strengthening both mind and spirit in harmony with the body, principles which Pilates would later focus on in his later methodology (Eva Rinke 2015). By adolescence, Joseph Pilates had changed from a weakling child to a strong young man. Eva highlights how Joseph’s later focus in the movements and anatomy of the body stemmed back to this childhood, his mother’s interest in natural medicines as a naturopath, the time spend in the countryside observing the movements of the animals, and an old anatomy book given to 12 year old Joseph by the doctor who ministered to his baby sister Gertrud prior to her death. Through this he could explore the workings of the body. Javier Perez Pont and EsperanzaAparicio Romero’s 2013 biography, provides a fascinating insight into Pilates’ pre internment adult life, initially as a brewer in Germany with his first wife and their family, until tragedy strikes. By early 1914, widowed Pilates had arrived in Britain, initially settling in London and seeking work in a London sanatorium. When this failed he sought other ways to make a living, including putting his boxing skills to work both in the ring and teaching, London being a centre for the sport, and teaching “body building” to the London police and “the art of self-defence” to detectives. “…when he was making a living as a boxer and a circus tumbler he began developing a series of exercises to relax him after an exhausting day”. By the outbreak of WW1 he was with a circus in Blackpool, and Pont/Romero note that it was observation of the Chinese performers which provided the inspiration for his “Chair”. His last address before internment was 22 Milbourne Street, Blackpool, a small guest house owned by a widow called Eliza Tipper, herself a former resident for a while in Crosby, Isle of Man. (Pont/Romero 2013). On 4 August 1914, everything changed for the young German living in England. By 5th August he was considered an “enemy alien” and had to register at his local police station. Days later, 30 year old Pilates was amongst the very early arrests, possibly hampered by being so new to Britain and his lack of English, the fact he was based on the coast and the fact he was with a travelling circus all possibly giving rise to suspicion that he might be a spy. He is registered as index number 14001 and incorrectly as Pilatus, later amended to Pilates. During this period internees were moved as camps became established and as British Government internment policy developed. Pont/Romero’s research follows Joseph from Sandhurst for questioning to internment in Jersey and then to internment at Lancaster temporary internment camp in a derelict former waggon works, before his main internment at Knockaloe. Initially Knockaloe had been planned to hold 5,000 internees, however with the sinking of the Lusitania it was reluctantly agreed to intern all enemy aliens, and the location agreed to take the majority of them was Knockaloe. Internees moved in as the compounds were constructed.By 12 September, camps 1 to 3 were full and Joseph Pilates was moved into Camp 4. By the time Joseph arrived there were over 16,000 internees and a “heimat”, a german “home” and culture, including physical culture, had been established. Various sports and exercise, including Gymnastics were already part of day to day life as this postcard of a “Turnfest” (gymnastics festival) on 27 September 1915, just days after Pilates arrival at Knockaloe, shows. For all internees, life at Knockaloe required them to have some money to buy additional necessities, earning it at the camp if they did not have access to money from families (which Pilates is unlikely to have), and keeping mentally and physically well. 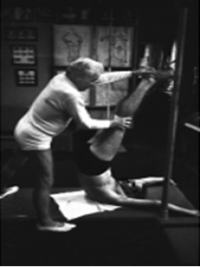 Joseph Pilates, like all internees, would have needed to focus on both. Whilst many internees, particularly the older family men, found the experience of their confinement a struggle, others were able to use the time as an opportunity to better themselves by studying or learning skills in readiness for their eventual release. Pilates was one of these. There are many stories emanating from this internment, originating from various comments Pilates made such as the interview in 1962 above, and there is much debate over what of his methodology was specifically derived from his internment. But it appears clear that his internment provided the opportunity to develop, both theoretically and practically, so much of the basis of what we now as the Pilates methodology. He had three and a half years with the opportunity to read the thousands of books in the Camp 4 library including those on sport and medicine/anatomy, the opportunity to further study the movements and anatomy of humans and animals, the opportunity to help the many who were so desperate for relief from the problems of body and mind induced by internment, but mainly he had the opportunity of time to think. “To our friend, Mr Pilates, professor and instructor of physical education, always willing….the most unselfish during four and a half truly horrible years… relying on his training we ought to feel fit, physically and spiritually, to the end….”. An internee’s granddaughter who visited us last year commented on remembering how her grandfather would do his exercises every morning without fail, exercises which she felt were akin to Pilates type movements. Boxing was a key sport at Knockaloe. Fellow internee, Cohen-Portheim, notes in his autobiography that Knockaloe was known as the "birthplace of German boxing". With Joseph's background both taking part in and teaching the sport, it was perhaps inevitable that he would become invloved in Boxing at Knockaloe. 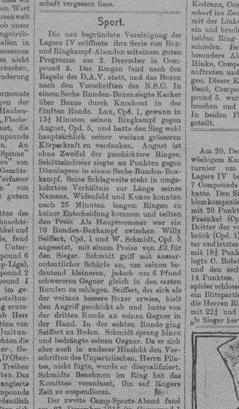 Pilates was over 30 when he was interned, perhaps his days of taking part were over however, his involvement in Boxing at the camp is evidenced by the Knockaloe Camp 4 internal newspaper, Lager Zeitung, from January 1917 that Pilates was involved in supervising sport at Knockaloe. He is here noted as the referee at a 10 round boxing match in which one contestant, Seiffert, went down in the 8th round. Schmidt, his opponent, leapt upon him and pressed him. But because he had not followed the instructions of the referee, Mr. Pilates, he was disqualified. Schmidt’s behaviour in the ring meant that the committee suspended him for a considerable period of time. (Extract of original January 1917 Lager Zeitung courtesy of The British Library, and many thanks to Dr Kewley Draskau for its translation). The Hospitals at Knockaloe and the links with his later equipment such as the "Universal ReformerTM "
“……there I met people who were invalids because of wartime illnesses and due to their imprisonment”. “…..began to devise machines to help them in their rehabilitation”. “I had plenty of time to invent chairs, beds and exercise equipment while I was held for four years on the Isle of Man in the World War”. Each hospital had 7 to 10 internee orderlies to assist with patients, each of whom were paid to do this role. As noted above, as well as keeping occupied, internees without access to family money in Britain had to seek employment within the camp if they could. One paid role was as an orderly within the hospitals of Knockaloe. There is no confirmed evidence as yet of his involvement in the hospital however Island resident, Pilates practitioner and himself an internee descendant, Jonathan Grubb, has located a photograph of an internee hospital orderly with medical staff in camp 2, who bears a striking resemblance to Joseph Pilates. 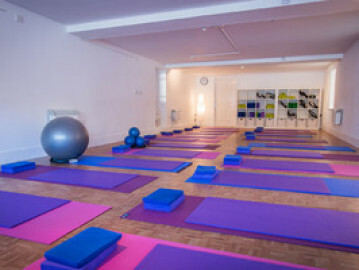 The general “story” is that Pilates worked in the Hospital and was asked to assist those confined to their beds with some form of exercise which they could do whilst in bed, and so he took the springs from the beds and attached them to the top and bottom of the beds to provide resistance to assist in their exercise. Certainly, at Knockaloe, the only photographed internee beds made from metal were those in the hospitals, an example of which is shown. Both Pont/Romero and Rinke have reservations regarding their actual use in the camp due to the minimal use of metal beds, internees sleeping on basic wooden beds, however looking at apparatus he designed, such as the “Reformer” and “Cadillac”, you can certainly see how they might have originated conceptually from a basic bed with springs. 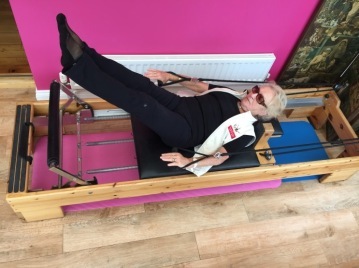 Mo Sherring of Isle of Man Pilates demonstrating one of the exercises for the Reformer, one of the spring based machines originally designed by Joseph Pilates. A February 2008 article by Freelance writer Robin Westen in Pilatesstyle magazine details her interview with Mary Pilates, Joe and Clara’s niece who worked with them and who was the daughter of Joseph’s brother Fred Pilates. The article includes a photograph of a miniature model of Josephs’s first reformer, which we currently understand was made by Joseph Pilates whilst he was interned so that, once back in Germany, his brother Fred who made his initial machines in Germany could use this to make the full sized prototype (awaiting confirmation from the author). However both Pont/Romero and Rinke suggest that some of Pilates’ claims or comments should be treated with caution. Pont/Romero’s biography considers a number of other claims, particularly with regard to the fact that no soldiers were interned at Knockaloe, his claims regarding the numbers of internees he taught his exercises to and the fact that this is not referenced in those reports and papers which survive, and his analysis of Pilates claims with regard to the influenza outbreak at the end of WW1. Pont/Romero consider each of these and other issues and draws conclusions upon each. Despite the War ending in November 1918, it took many months before the internees were repatriated. Pilates’ repatriation did not commence until mid March 1919 when he left Knockaloe for repatriation to Germany via the repatriation holding camp at Alexandra Palace (Pont/Romero, Rinke, ICRC). Pont/Romero notes that Josef Pilates arrived back in Germany on 22 March 1919 at the age of 36 and was reunited with his 14 year old daughter Helene Luise and his stepson, Wilhelm. They note that Europe after the war was a dramatically different place. In Germany the Kaiser’s Abdication in 1918 resulted in the Weimar Republic. Pilates spent the next 6 years developing his techniques and machines, work which included assisting the Hamburg police in physical training. But by 1925 Hitler was gaining power in Germany and with the Police being developed on a more military basis, Pont/Romero notes that Pilates links his departure to this change in Germany and in 1925 he patents his “Universal Reformer ™, initially in America but also in Europe”. With American awareness of their low levels of physical education and a move to improve this, and with America being far behind Germany in the understanding of sports medicine and training, this became a real opportunity for Joseph. He emigrated to America in 1926, meeting his third wife, Clara, en route. Together they established studios visited by, and which helped, so many over the long years (refer to the biographies by Pont/Romero and Rinke). In the 1962 article above, Pilates was in his eighties and still very much practicing his methodology. Pilates died in 1967. Brings together Pilates’ writings and early mat excercises. Javier Pérez Pont and EsperanzaAparicio Romero’s Biography “Hubertus Joseph Pilates” is published in Spanish, Italian and now English by Hakabooks.com 2013 . The Pont/Romero biography critically analyses the origins of Pilates, resulting from detailed research. Pont/Romero note that the book has sought documentary evidence, supported by interviews with family, colleagues and friends of Joseph and Clara Pilates to provide a more properly researched document aimed at dispelling some of the various myths contained on websites surrounding Pilates. Whilst the documentary evidence provides reliable primary evidence, the oral testimonies are of course secondary evidence and may well be anecdotal, however Pont/Romero have sought to gather all of what is currently known or believed into one document. They comment that such research never ends. Eva Rinke’s biography "Joseph Pilates. Der Mann, ...dessen Name Programm wurde" is published in German in 2015 by Herder. “lots of details about life in the camp and the great boxing community Joe Pilates was part of. For Joseph Pilates his internment in Knockaloe in the end turned out to be a blessing: he finally had enough time to develop his ideas of body culture: his exercises which became famous many years after his death. A real source of inspiration for him was the Manx Cat!" This pamphlet refers to a letter from senior internee(s) at Knockaloe regarding Joseph's work at the camp. The extract is as quoted in Pilates' pamphlet. Photograph Sources are as reference under the photographs or link to the accompanying narrative.